Case in point, changing the air filter. On the old bike (2000 Kawasaki Nomad) you removed one screw, removed the cover, removed the old filter, installed the new filter, replaced the cover and screwed in the one screw… Not so easy on the Goldwing. The air filter is in the bowels of the beast, requiring dismantling a lot of stuff. Once you finally get to the air filter there are 7 very hard to get to screws to remove the cover. Because of the tight fit, the old filter is a pain to remove and the new filter even harder to get back in. Needless to say. it took a long time to complete. I’m so glad this does not need to be done frequently. Frequent maintenance (oil and filter change, battery and coolant check and adding) aren’t too bad. Hopefully Honda will rethink doing maintenance on newer models. Note: If you do anything on the Goldwing, label all the bolts and screws as to where they go. It’s not obvious, but there are many different sizes and lengths. They look the same until you try putting them back. It is a bugger figuring which ones go where. 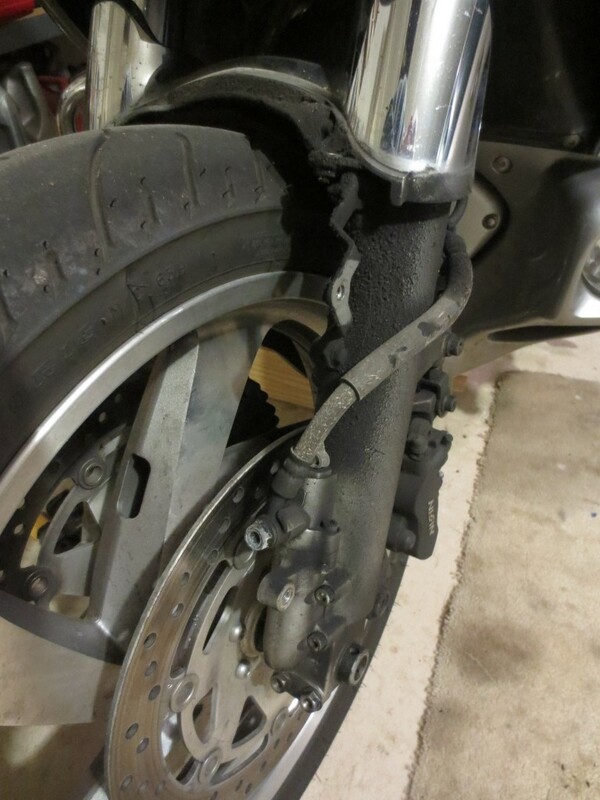 Leaky left front fork on the Goldwing. The other repair was to replace the fork seals. Apparently the Goldwing has a common problem with the fork seals; or I should say, the left fork seal. When breaking hard and the anti-dive kicks and if you are on a rough road; that can blow the left fork seal. Why the left you ask? The anti-dive mechanism is only on the left fork and works by locking the left fork. I have had to break hard several times. Once for a big Elk in Wyoming and for several idiot drivers. I don’t remember doing it on a rough road but once going over a railroad track. Anyway the left forked was leaking and needed the seal to be replaced. I did some research on the subject and found many remedies but I didn’t like most of them that disabled the anti-dive. I decided to repair everything with stock parts. If it happens again I may revisit the other options. I have never done any work on forks before. I was going to have the Honda dealer do it until they quoted me the cost of $600 plus. I was afraid to ask about the cost of replacing the air filter. I decided to make good use of my shop manual and do it myself. The parts were less than $100 from Wing Stuff. I also bought the Traxxion fork serve tool kit. 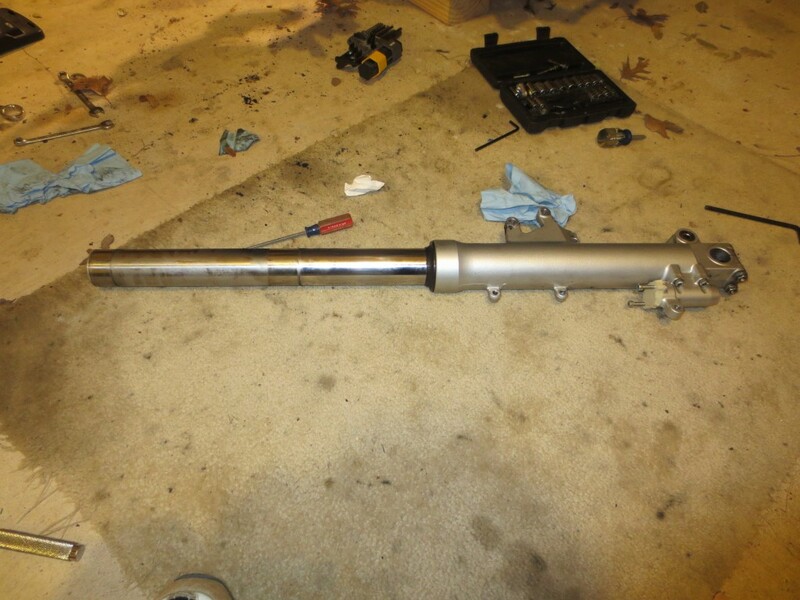 The tool was a big help when installing the parts. After checking online for tips and information, I gave it a try. It really wasn’t too bad except for constantly referring to the shop manual or online video. Just take your time and do it right. This video was a big help. 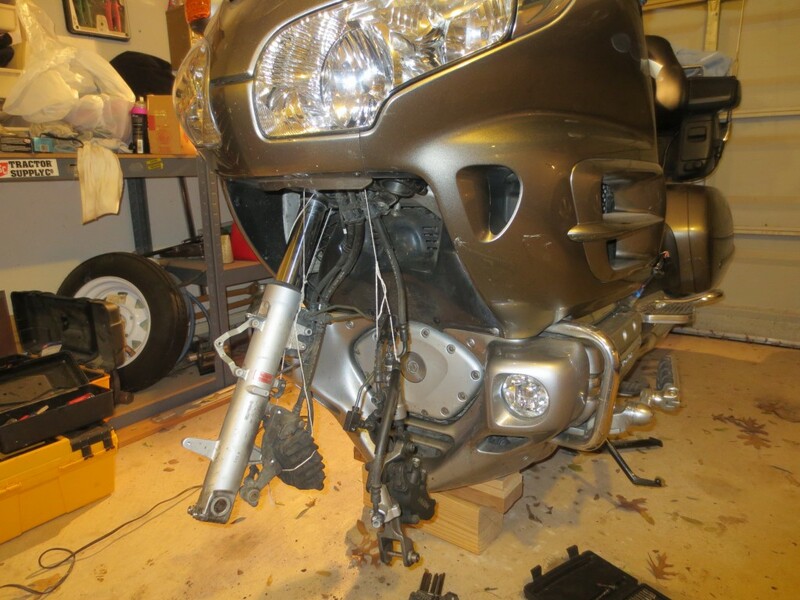 The video shows how to install “Progressive Monotube Fork Cartridge Kit” for the Goldwing. It showed how to disassemble the forks. Watching the video was better than reading the service manual for the disassembly. I thought about making this a how to post. There is so much good information out there, I really can’t add much except for my 2 cents worth. So I will leave it at that. I actually enjoy working on my bike but with the Goldwing it can be real work. I would suggest doing it yourself if you are mechanically inclined. Just take your time to do it right. Rush it and there will be do overs and it could affect the safety of your bike. 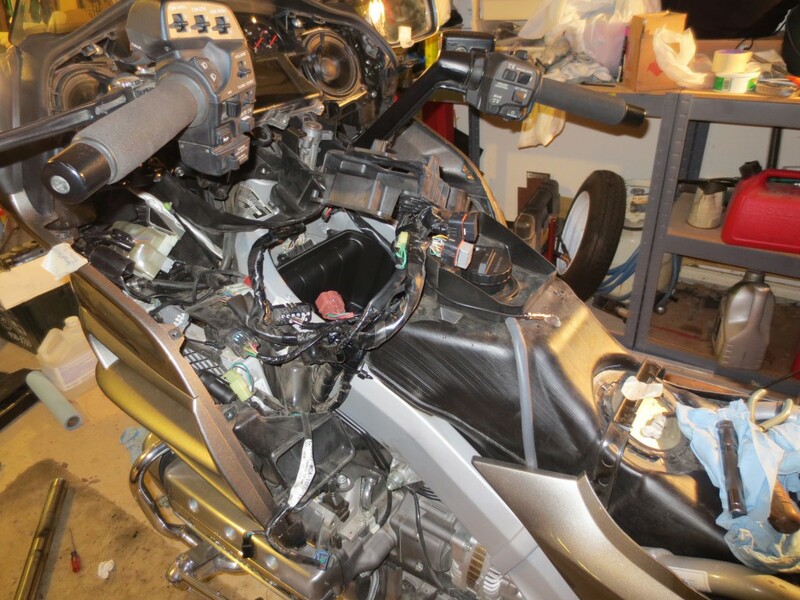 So what are your experiences with maintenance on the Goldwing or other bikes. We would love to hear about it. Got any tips or tricks?